Several of these bugs were found on flowers of velvet mesquite, Prosopis velutina at Hassayampa Preserve, Maricopa Co., Arizona. 13 April 2014. Native plants when blooming almost always harbor large numbers of thrips - very small insects even smaller than this minute pirate bug. Most thrips are yellowish and might look like pollen grains until they move. Tap a flower - like the inflorescence of desert broom or brittle bush and you're sure to find them. 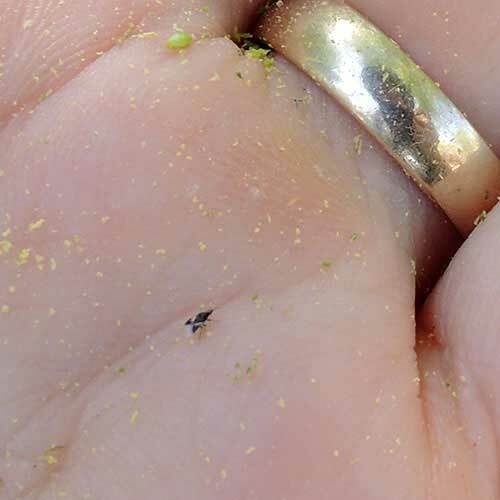 Minute pirate bugs prey especially on thrips and without their assistance gardeners and farmers will be losing a battle with an exploding population of plant feeding thrips. The black and white pattern of these beneficial insects makes them easy to recognize.